Who could compose a worthy encomium of literacy? For it is by means of writing alone that the dead are brought to the minds of the living . . . While it is true that nature is the cause of life, the cause of the good life is education based on the written word. Siculus was a historian—a great one in fact, who authored a 40-volume work comprising the entire history of the known world. I have been thinking lately about his idea that words speak to the dead, and what this means for a people. Words create a historical record—thus allowing us to form a sense of national progress and identity—and they provide vital opportunities to address a nation’s history. I realized as much as I recently read Letters to Memory, in which the Japanese-American author Karen Tei Yamashita converses with the many documents that have preserved her family’s experience as internees during the Second World War. Yamashita was not yet born when her family members were taken from their homes and forced to live for well over a year in a barren wasteland deep in the Utah desert—the man who would become her father was still young and unmarried at the time—but by poring over the letters, diaries, and other documents that retain her family’s experiences she had the opportunity to construct a dialogue. It is from this encounter that her beautiful, necessary book has emerged. I have asked myself why the family saved these letters. You might say they were historians, that they knew the value of their stories, this proof of their thoughts and actions in unjust and difficult times. History is proffered to the future. This is what we did. Do not forget us. Please forgive us. In 1942, Yamashita’s father, grandparents, aunts, and uncles were told to assemble for pickup at the First Congregational Church in Berkeley, bringing only what they could carry. (Against regulations, her aunt was reputed to have taken a vacuum cleaner and waffle iron.) After being placed into custody at the Topaz internment center, they lived in spare conditions in the desert for over a year, in the process losing their homes, their jobs, their community, and virtually all of their possessions. Upon their release in 1943 the family was scattered throughout the United States, where they faced discrimination and the enormous challenge of starting their lives over. 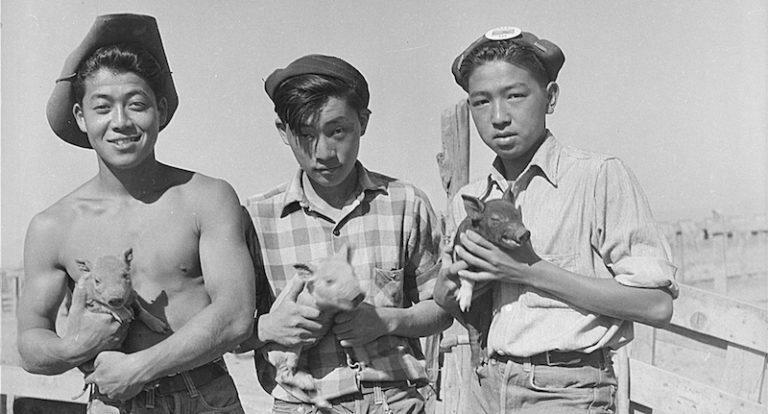 They were among 120,000 Japanese-Americans so treated, the majority of which were US citizens. It is obvious that this constitutes a grave historical injustice—what does a nation do with such wrongs? In 1988 President Reagan signed a bill that provided for reparations—each detainee was allotted some $20,000, although many of them had died by then and the $1.2 billion that was distributed represented only a fraction of the wealth that was lost by these individuals. Even though this was a victory that the Japanese-American community had fought hard to win, and the apology was a major (if long overdue) accomplishment, monetary compensation and official admittance of guilt can only be one part of the work of memorializing, forgiveness, education, and dialogue through which such deeds are truly brought to rest. Where do personal mechanisms of grievance and understanding insert themselves into this machinery of bureaucratic justice? Yamashita first began looking into her family’s past when in 1995 she discovered some papers long held by her Aunt Kay. Soon she became known throughout her clan as the repository of all family documents, and in combing over these archives she began to encounter the internment of her family in a way she had not previously been able to. This was when her dialogue began to emerge. Yamashita calls her project “memory”—it is memory that blends the author’s own recollections with historical narratives, personal papers, bureaucratic records, and great historical tomes. It is perhaps a species of group memory formed over thousands of years as humans have engaged the questions of war, necessity, failure, grievance, law, justice, forgiveness, and transcendence, all taking place through the medium of the written word. As we all must do, she is finding her own place in this legacy, hewing out her own sense of what she is and what has transpired in the lives of those closest to her. Yamashita knows that to a large degree her parents’ lives were shaped by their internment and the discrimination prevalent throughout postwar America, and she knows that these lives in turn made her who she is. This history is in her, it is personal as can be, and yet it is also a significant part of her nation’s story. Her book goes beyond her personal story to situate this episode of US history into the larger fabric of human history. So it is more than memory, it is a means of creating her own contribution to this discourse that has occurred over generations. Yamashita poses this book as many things—revenge, resistance, recovery, documentary, inquiry—but I read it most fundamentally as an act of forgiveness, a thing that she says “requires the confrontation of two parties, a meeting face to face between people who have the capacity to hurt one another, and thus, perhaps, to discover grace.” Needless to say, when things are buried so far in the past such a meeting largely occurs through written words. If we are fortunate, we forgive, but we do not forget. Letters to Memory is an important book in part because it points to how a nation’s past errors are never really over, and how it nonetheless inches its way toward a future. There are plenty of reminders that the internment still lives on, not only in records but in the Japanese-American identity and in the lives of the descendants of internees. Yamashita goes beyond her family’s story as internees to unpack what that experience became as they dealt with the ordeal of building new identities and re-establishing their communities in the face of great loss and ongoing racism. It also very personally deals with the author’s emotions regarding this legacy. This is the work of establishing these deeds as an ongoing, living part of America’s being. The last surviving member of Yamashita’s family to be interned during World War II died in 2015: we are at a moment when the living memory of this shameful act is disappearing from the world, which surely must have been a motivation for the creation of this book. Once the last survivors have passed on, all that will exist of this episode are the written testaments, along with the documents of American bureaucracy, news stories, records of the resistance, and the little that remains of the camps themselves. If these acts are to be learned from, and atoned for, it will require the work of authors and historians to keep that memory alive and that conversation moving forward. I have visited two of the sites of Japanese internment: at Manzanar, east of the California Sierra Nevadas, there is a visitor center and some preserved buildings, but the great majority of the camp has long since been dismantled and appropriated by people in the Owens Valley. If not for the concerted efforts of Japanese-American activists to construct a site of memory on the Manzanar space, it would likely resemble the other camp I have visited, Tulelake camp, where all one can now access is a small placard in remote Northern California. I remember what it was like to stand there on a chilly summer day, a violent wind rocketing past my face, trying to imagine how it would feel to be taken from my home and forced to live in this dismal wasteland. Tulelake is a piece of our past that, like so much of our history, has been lost to the forces of decay and barely exists any longer in any meaningful way. I am grateful to the people who have fought to maintain the memory of what happened in Manzanar, for it is only through their work that I was able to see the conditions of those who were forced to live there and learn some of their stories by reading some of the documents they left behind. I am, of course, also grateful to authors like Yamashita, who have fought so hard to make this story vivid and to think through its implications with a true wisdom. As I read Letters to Memory and thought of the ways in which Japanese-Americans have sought to reconcile with and preserve this legacy, I couldn’t help but think of the ethnic and gender groups that are currently being demonized by the United States government. Although there has been talk of a “Muslim registry,” thus far nothing has occurred that can compare to the wrong inflicted during World War II, but still families have been scattered and decent people have been terrorized, and there have been beatings, murders, and bombings. Certainly those who have had to find some way to endure these wrongs are now creating their own paper trail as they reach out to their loved ones for support and seek redress from the authorities. These deeds are becoming part of the American identity, and they too will have to be dealt with. We must do the hard work of keeping this national memory alive and conversing with it. Yamashita writes that she does not intend her book to merely be a sermon, an application of past wrongs to present-day evils; rather it has “no formed definition . . . except an intuition that you would listen and be attentive and somehow understand.” And, in fact, the scope of her book goes far beyond the experiences of her family, as she puts in conversation, among others, Homer, Gandhi, the Buddha, the Vedas, and numerous other writers, thinkers, and texts. She writes that “every history is a story told, weighted by the knowledge of the teller,” and I think it is here—in the knowledge of the teller—one locates that elusive quality that Yamashita hopes will elevate her act of memory beyond a sermon. There is a responsibility here: to herself, to her family, to history, to the future—and also her nation. Yamashita’s story has become a part of America’s account of itself, this process of wrongs, redress, and reconciliation. To my mind, this is the building of a nation’s history. In remembering, it is important to come to grips with the past. No nation can fully understand itself or find its place in the world if it does not look with clear eyes at all the glories and disgraces of its past. We in the United States acknowledge such an injustice in our history. The internment of Americans of Japanese ancestry was a great injustice, and it will never be repeated. I include this in part to illustrate how far the Republican Party has fallen—from a President who said “it will never be repeated” to one who talks of Muslim registries and supports white supremacists. And I also include it because Bush is correct: no nation will be great if is does not understand its past. For exactly this reason, we are blessed to have writers like Yamashita. Some politicians want to get rid of the AP U.S.-history curriculum because it paints a cynical picture of the country's backstory.